This Talkartoon, published in 1932, is Betty Boop's fifteenth cartoon appearance. This cartoon is billed as a Betty Boop cartoon, with Bimbo and Koko, and starts out with one of the songs written for Betty Boop. We believe that the singer is Arthur Jarrett; it sounds like him, but we don't know for sure. Wait 'til you, get a view of Sweet Betty! Although aside from these, she's got so much of those! The cartoon takes place in a circus tent, where Betty is one of the performers. The action starts out with a parade rendered with crude but truly comical animation. The elephant, puzzled-looking, small-headed, and stiff-legged, is particularly funny-looking. We have an inflatable fat lady, and Koko the clown is extracted from an inkwell to participate in the parade. We should mention here that Koko is the oldest of the Fleischer characters. The brothers invented him when they were first experimenting with the technique of rotoscoping (drawing an animated figure over actual film footage) to produce smooth and realistic animation. Dave Fleischer put on a clown suit and clowned around while Max and Joe filmed him. The rotoscoped result was the first Koko. Koko cartoons go back at least as far as 1924. He is a clown, of course, with a small, cylindrical head, a conical hat, and prominent, narrow black lips. He is, in our eyes at least, a singularly unattractive figure. After the parade, we see a high-dive act, introduced by the ringmaster, the cartoon's villain. Like the villain in Mask-A-Raid, the ringmaster also has prehensile facial hair in the form of a very nimble mustache. We also see some typical audience gags, the main one involving Bimbo and his little brother Aloysius. Bimbo's only role in this cartoon is as a peanut vendor. He stands in front of Aloysius while hawking his peanuts, blocking Aloysius's view. Aloysius refuses to buy peanuts the first couple of times he is asked, and when he finally agrees, we find that Bimbo doesn't even have any peanuts. Oh, but don't take my boop-oop-a-doop away! At this point, Koko the clown comes to Betty's rescue. Koko and the ringmaster duke it out, and afterwards Koko whispers a question in Betty's ear, to which she answers, "No! He couldn't take my boop-oop-a-doop away!" Then Koko plants his succulent lips on Betty's cheek for a prolonged smooch, which Betty seems to enjoy, and the cartoon ends. We don't think that Mae Questal did the voice for Betty Boop in this cartoon, but she and Rudy Vallee produced a film short called Musical Justice in which she performed "Don't Take My Boop-Oop-A-Doop Away!" If you want to see Betty Boop in human form, this film can be found on Radio Rhythms, volume one of Hollywood Rhythm, the Paramount Musical Shorts, 1929 - 1941. Do you like the music in this cartoon? 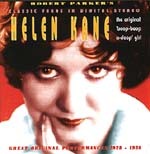 You can hear Helen Kane herself performing "Do Something" in this CD, Helen Kane, the original boop-boop-a-doop girl!